Jim Carey h as recently signed on to star in an adaptation of Mr. Popper’s Penguins. 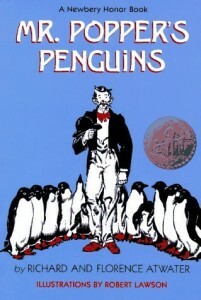 Written by Richard and Florence Atwater, Mr. Popper’s Penguins was first published in 1938 and tells the story of a house painter who receives an Adelie penguin in the mail from Admiral Drake’s Antartartica explorations. One penguin turns into 12 the Poppers decide the only way to keep them all is to turn the penguins into performers. More at Deadline Hollywood Daily (including some great comments). Meanwhile production on continues on Happy Feet 2 in 3D (George Miller). Animal Logic, which next month will release Legend of the Guardians: The Owls of Ga’Hoole (Zach Snyder), is currently completing key animation in Santa Monica while George Miller’s new Dr. D Studios is wrapping up voice animation and preparing to render the film in Australia. While Elijah Wood and Robin Williams will return in voice roles, Brittany Murphy (who voiced Gloria) passed away earlier this year. In late January her husband went on NBC’s Today and blamed her death on Warner Brothers because the studio pulled her from the remake a week before her death. Gossip aside, films such as Happy Feet 2 continue to raise important questions about the responsibility of ecocritics to hold media producers accountable for sustainable production practices. In a recent article for the Data Knowledge Center, John Rath explains why Miller’s new supercomputer ranks on Australia’s Top 500 list. Whether or not this ultimately lowers the film’s ecological footprint, however, remains unclear. Happy Feet 2 is slated for a November, 2011 release when it will go up against the next installment of the Twilight franchise. Penguins vs. Vampires!